This is pretty interesting. I think we could be higher if the winters were not so long and cold. Published the Tuesday 26 November 2013 by Gwen at 15:00 in Business, Canada, Education, Health, News, | No comment . 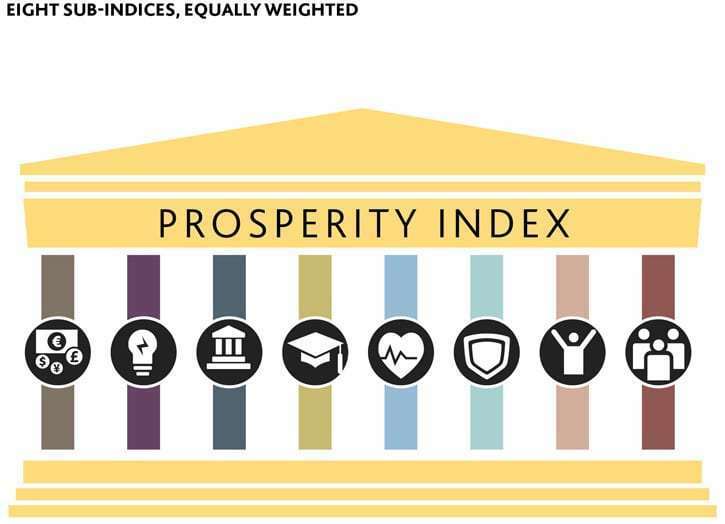 The Legatum Prosperity IndexTM 2013 is out, and Canada ranks 3rd in the world for its overall prosperity, right behind Norway and Switzerland. The country’s ranking leaped from 6th to 3rd in just one year, thus confirming its position as the leader of the Americas region. For five years now, the Legatum Institute has been compiling and comparing data of 142 countries in order to draw one of the most accurate and comprehensive portraits of prosperity around the world. Their vision is that prosperity should include not only objective economic indicators, but also subjective evaluations of well-being and development indicators as perceived by the population. With an impressive balance between scientific rigor and user-friendly design (just play with the interactive map and shuffleboard), the website provides great insights on prosperity to both the expert and the neophyte. In this changing, post 2008 economic crisis, post Arab Spring world, Canada’s prosperity is exemplary on economic stability and human development alike. Below is a digest of Canada’s data, grouped by LI sub-indexes and revealing the key elements that make Canada the third most prosperous country in the world. Adapted from The Legatum Institute website. Prime could double by end fo 2015. All the more reason to take the 5 year fixed rate. Here is some fuel for the fire of fixed rates- which have never been this low! Below you can read the boring data we digest daily to give you the best un-biased opinion on your mortgage. Does your banker do this for you – no way! Mark Herman, Calgary Alberta Mortgage Broker. Canadian Press: Most economists believe the Bank of Canada Governor Stephen Poloz and the central bank won’t budge off 1% until the first quarter of 2015, and perhaps even later. OTTAWA — Just last month, the Bank of Canada dropped a mini-bombshell by adopting a neutral position on interest rates, after long insisting that any eventual move would be up. That left open the real possibility the central bank may, instead, lower borrowing costs — at least until the struggling economy regains its momentum. Textbook economics would say that deflation should have already arrived at our doorstep. Now, the global think-tank that helps guide countries along a growth path says Canada’s central bank may actually resume its course for higher rates — beginning as early as next year — as that economic momentum returns and inflation starts to pick up speed. “With spare capacity narrowing by the end of 2015, monetary policy tightening may need to begin by late 2014 to avoid a build-up of inflationary pressures,” the Organization for Economic Cooperation and Development said Tuesday. The first move above the bank’s current 1% lending level — where it has been since September 2010 — will likely come in the fourth quarter of 2014, the Paris-based organization said in the report, and continue rising to 2.25% by the end of 2015. Many economists have been expecting the first move, if it is up, to come in the first quarter of 2015. “The pause in the economic recovery since early 2012 has continued this year,” the OECD said its economic outlook for Canada, part of a larger global report. But exports and business investment should begin turning around through 2014 and 2015, leading to growth of 2.3% next year and 2.6% a year later, it said. In 2012, the Canadian economy edged ahead by 1.7% and the organization is forecasting the same pace this year. The OECD, which has 34 member nations with both advanced and emerging economies, is predicting the world economy will expand by 2.7% this year, followed by 3.6% growth in2014. The United States, which will remain Canada’s biggest trading partner for the foreseeable future despite free-trade deals in other regions, should grow by 1.7% this year and ramp up 2.9% in 2014. The eurozone has managed two quarters of modest growth so far this year, after emerging from a long recession. But the OECD predicts another contraction — of 0.4% — this year, before returning to growth of 1% in 2014. “The main risks to the projections are ongoing uncertainty about the U.S. economy and the potential for renewed tensions in sovereign-debt markets and the financial sector in the euro area,” the OECD said. That is a concern shared by the Finance Department and Bank of Canada. Both have cautioned consumers not to binge on the current cheap-credit environment. The concern is that households could be caught in a spiral of rising interest payments and shrinking equity in their homes if the market turns cold. Last week, Finance Minister Jim Flaherty said he was prepared to tighten lending rules on home purchases — as he has four times in four years — if too many Canadian are seen getting in over their heads with mortgage debt. Meanwhile, on the same day the central bank surprised analysts by dropping its rate-increase bias, governor Stephen Poloz and his policy team downgraded their outlook for the economy. I have had many people ask what home prices are going to do over the next 4 or 5 years. Well here are the numbers! Remember, if Alberta were a country our growth would be the same as the world leader – China! – Mark Herman, Calgary Alberta Mortgage Broker. CALGARY – The average price for a resale home in Calgary will balloon to more than half a million dollars by 2017, according to a new real estate report released Tuesday. The Conference Board of Canada’s Autumn Metropolitan Housing Outlook, commissioned by Genworth Canada, said the average price for all residential property in Calgary will grow from $431,760 this year to $517,016 in 2017. “Calgary is facing a lack of inventory in particular areas,” said Tanya Eklund, a realtor with RE/MAX Real Estate (Central) in Calgary. Calgary’s economy and housing demand continue to thrive as energy sector activity remains healthy. Rising GDP is spurring employment growth,” said the report. “On the resale housing market front, solid sales will lead to sound price gains this year and next. The new housing market is benefitting from strong absorptions, which are trimming unsold stocks of new units and fostering new construction. The medium term also looks decent. The report said summertime flooding in Calgary will limit Calgary’s GDP to 3.3 per cent growth in 2013, modest by recent standards. Output will rise a slightly faster 3.4 per cent in 2014, spurred by government-funded rebuilding efforts. The job market will continue to expand, with annual growth of 2.4 per cent this year and 2.8 per cent in 2014 cutting the unemployment rate from 4.9 per cent this year to 4.6 per cent in 2014. Economic health should continue between 2015 and 2017, with GDP expanding roughly three per cent and employment rising about two per cent each year, it said. “Calgary’s strong economic fundamentals allowed its resale market to largely shrug off the floods. Seasonally-adjusted sales and the average resale price actually rose during June, the flood month, and have subsequently advanced,” said the report. “Unsurprisingly, Calgary’s resale prices are rising briskly. Year-over-year growth has averaged a solid 4.6 per cent in the latest four quarters, including a first quarter jump near eight per cent,” said the report. “These increases will lift Calgary’s average price 4.7 per cent in 2013, the largest gain since 2007 and finally exceeding that year’s peak value. Similar price growth is expected between 2014 and 2016, with a slight tapering in growth to four per cent in 2017. The report said buoyant housing demand is also energizing the new home market. Absorption of new units averaged 11,200 units in the four quarters to the second quarter of 2013, up 25 per cent from a year earlier. This included a surge to an annualized 15,000 units in the second quarter, the most since 2008. This strength will lift absorptions to a full-year total of 12,140 units in 2013, up 25 per cent from 2012. Another increase of nearly six per cent in absorptions is expected for 2014, but still trailing the peak of 13,700 units reached in 2008. “Healthy new-unit take-up fuelled a big jump in housing starts to 13,186 units in 2012, more than double the recessionary trough in 2009, but well off peak levels of the last decade,” it said. “We expect starts to ease a modest 2.7 per cent in 2013 as an 11 per cent dip in multiple starts slightly outweighs a seven per cent gain in single-detached starts. For 2014, rebounding multiple starts will fuel a five per cent increase in total starts despite relatively unchanged single-detached construction. CALGARY – Calgary’s booming housing market is pushing average prices to record levels as single-family home sales so far this year are averaging well above half a million dollars. “The residential real estate market is holding strong for sellers,” said Grace Yan, a Calgary realtor with RE/MAX Real Estate (Central). As of Thursday, according to the Calgary Real Estate Board, the average MLS sale price for all residential property in the city so far this year has been $457,123. The annual record is $428,649 set last year. In 2004, average sale prices in the city were $227,269. So far this year, the average MLS sale price for a single-family home is $517,598. The annual record price of $481,259 was set last year. In 2004, the average was $251,558. On Friday the Canadian Real Estate Association released its latest MLS data for October showing that Calgary had the best year-over-year gain in the country in the MLS Home Price Index. CREA said prices in Calgary, for homes tracked by the index, rose by 8.17 per cent from last year while the national average of 11 markets surveyed was up by 3.52 per cent. Scott Bollinger, broker with the ComFree Commonsense Network, said there was a little softness in the market last year because of the introduction of tighter mortgage rules. “But the Calgary numbers we’re seeing today show this is the strongest and healthiest housing market since the 2006 boom,” he said. “That said, this isn’t the boom — and that’s a good thing. 2006 was marked by some things we’re not seeing today — a massive inventory crunch, irrational exuberance and confidence that the market would stay strong indefinitely, and almost unthinkable economic growth. We saw six and seven per cent growth in 2006. In October, Calgary had 2,510 MLS sales, up 19.3 per cent from last year. Alberta registered 5,588 sales, up 16.1 per cent, and Canada had 39,039 MLS sales for an annual hike of 8.3 per cent. Average sale prices in October and their year-over-year increase were: Calgary, $436,216, 4.2 per cent; Alberta, $377,084, 3.8 per cent; and Canada, $391,820, 8.5 per cent. Calgary’s real estate market is showing no signs of slowing down in November. Month-to-date including Thursday, there have been 830 MLS sales in the city, up 34.30 per cent from the same period a year ago, according to CREB. The average sale price has also climbed by 7.47 per cent to $463,126. Doug Porter, chief economist with BMO Capital Markets, said there are two notable splits developing in Canada’ housing market – larger cities are hot, while smaller cities are generally not, and sales in the West are strong, but are weakening in much of the East. Boring data below – and we also have *secret* data that the government is going to make things harder for home buyers = buy sooner if you can before the program you may need no longer exists. This is true ESPECIALLY for SELF EMPLOYED people. Canada’s finance minister says he’ll intervene in the housing market for a fifth time, if that’s what’s needed, to head off any bubble. “We have to watch out for bubbles – always – in markets around the world, including our own Canadian residential real estate market, which I keep a sharp eye on,” Jim Flaherty said today in Edmonton, where he unveiled his fall economic and fiscal update, The Globe and Mail’s Carrie Tait reports. Mr. Flaherty’s latest move came in the summer of 2012, when he tightened mortgage insurance rules and deliberately sparked a slump in the residential real estate market. The effect of that has faded, however, and, as The Globe and Mail’s Tara Perkins has reported, sales have rebounded, at least partly because of expectations of higher interest rates. Canada’s housing market is seen by some groups as among the frothiest in the world, though most economists do not expect a U.S.-style meltdown. Mr. Flaherty’s comments highlight the continuing concern among policy makers over the strength of Canada’s real estate market as families continue to juggle record debt burdens. Indeed, the Canadian Real Estate Association is expected later this week to report another month of strong home sales in October, somewhere in the area of 12 per cent. As for his fall update, Mr. Flaherty now forecasts a budget surplus of at least $3.7-billion for fiscal 2015-16, the year of the next election, The Globe and Mail’s Bill Curry reports. Spending cuts, control of public sector wages and asset sales helped push the government to that projection from an initial forecast of just $800-million. The government now also forecasts a 2013-14 deficit of $17.9-billion and a 2014-15 shortfall of $5.5-billion. Going forward, the 2015-16 surplus would widen to $5-billion in 2016-17, $5.7-billion a year later and $9.8-billion in 2018-19. “The emphasis placed on responsible fiscal management has made Canada a recognized leader on the international economic stage,’ the government said in the document. The Canadian government relies on private sector forecasts for its economic assumptions, the average of which calls for economic growth of 1.7 per cent this year, 2.4 per cent next and 2.6 per cent in 2015. Mark Herman, Calgary Alberta Mortgage Broker. This is great news for buyers … you are buying a home and a great investment – not the case for other provinces. As we have always been saying … Alberta’s in-bound migration and strong job market will support home prices. CALGARY – For the second year in a row, Calgary is the top-rated market in Canada for overall real estate prospects, according to a survey of industry experts. Calgary kept the top spot with the highest ratings for prospects in three categories – investment, development and homebuilding, said the Emerging Trends in Real Estate report by PwC and the Urban Land Institute. “The Calgary economy continues to post solid gains, despite the disruption caused by summer flooding,” said the report. “The energy industry, primarily oil, remains strong and will continue to benefit from economic growth around the world. The report is based on a survey of over 1,000 industry experts including investors, fund managers, developers, property companies, lenders, brokers, advisers and consultants. The ratings of other Canadian cities in order following Calgary are: Edmonton, Saskatoon, Vancouver, Toronto, Winnipeg, Ottawa, Halifax and Montreal. The report said economic activity in Calgary is projected to grow at a 3.3 per cent rate in 2013 and a 3.4 per cent rate in 2014. Employment growth is expected to slow but remain good through the end of this year and into 2014, growing at 2.4 per cent and 2.8 per cent, respectively.